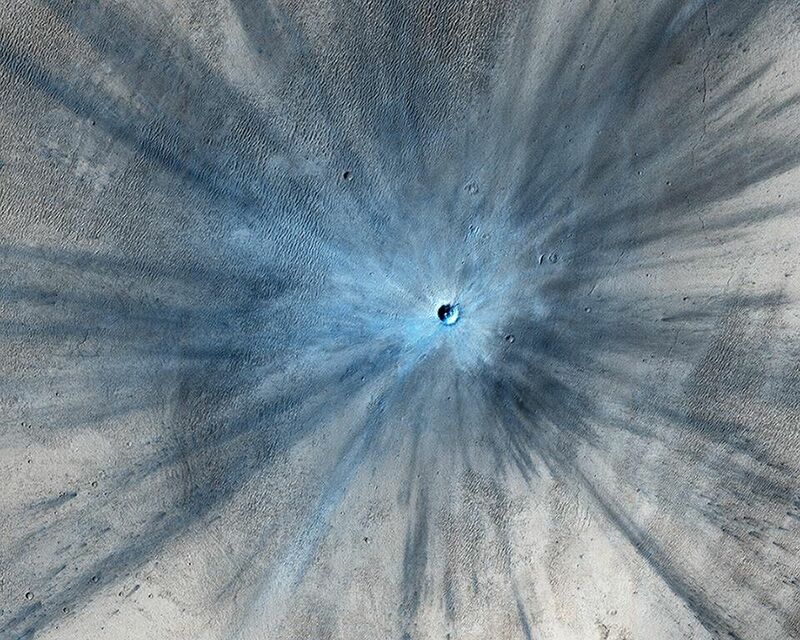 A dramatic, fresh impact crater dominates this image taken by the High Resolution Imaging Science Experiment (HiRISE) camera on NASA's Mars Reconnaissance Orbiter on Nov. 19, 2013. Researchers used HiRISE to examine this site because the orbiter's Context Camera had revealed a change in appearance here between observations in July 2010 and May 2012, bracketing the formation of the crater between those observations. The crater spans approximately 100 feet (30 meters) in diameter and is surrounded by a large, rayed blast zone. Because the terrain where the crater formed is dusty, the fresh crater appears blue in the enhanced color of the image, due to removal of the reddish dust in that area. 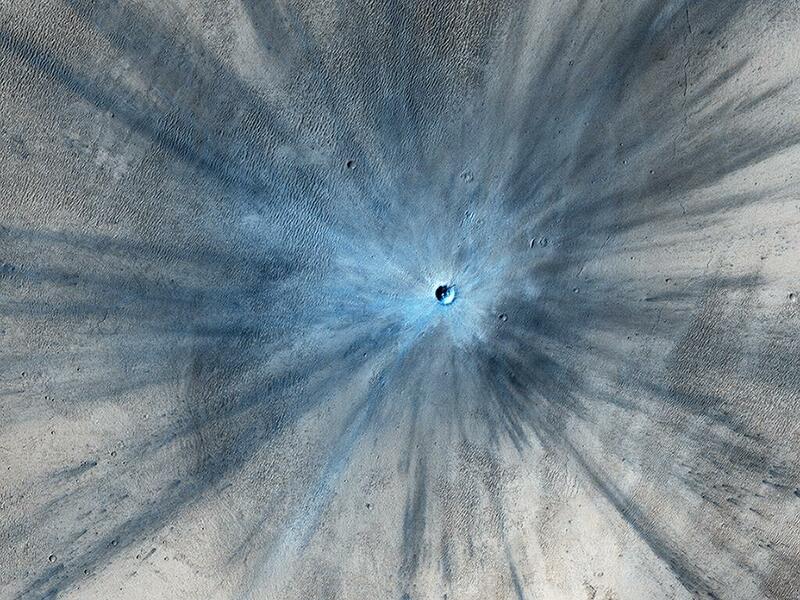 Debris tossed outward during the formation of the crater is called ejecta. In examining ejecta's distribution, scientists can learn more about the impact event. 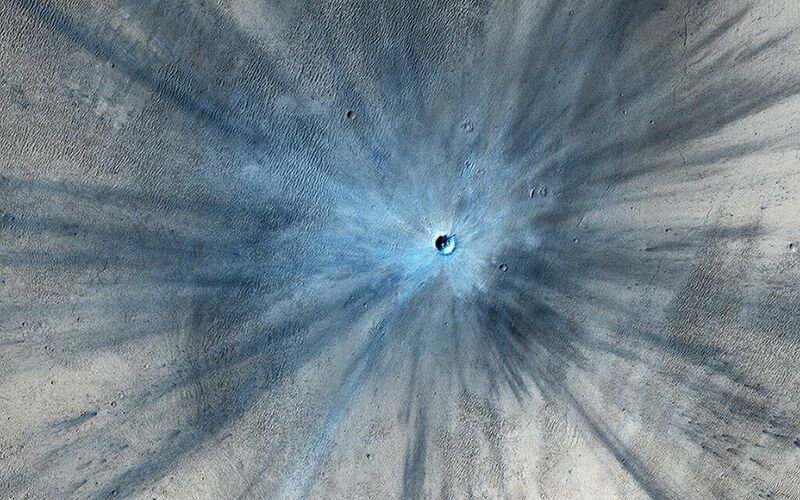 The explosion that excavated this crater threw ejecta as far as 9.3 miles (15 kilometers). The crater is at 3.7 degrees north latitude, 53.4 degrees east longitude on Mars. Before-and-after imaging that brackets appearance dates of fresh craters on Mars has indicated that impacts producing craters at least 12.8 feet (3.9 meters) in diameter occur at a rate exceeding 200 per year globally. Few of the scars are as dramatic in appearance as this one. This image is one product from the HiRISE observation catalogued as ESP_034285_1835. Other products from the same observation are available at http://uahirise.org/ESP_034285_1835.